How can you go wrong buying this solid 14k. gold ROLEX? We bought this watch from the original owner who maintained this watch beautifully over the years. She even retained the (valuable) and original box it was sold in! 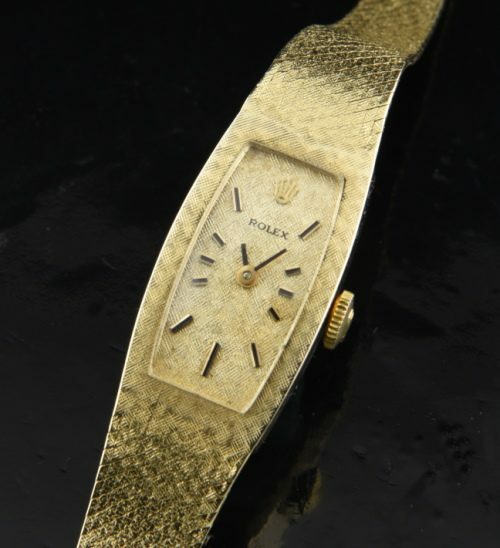 This 1970’s vintage ROLEX ladies watch measures 13x23mm. which is an easy-to-read dial-not tiny. This bracelet is full-length and will fit up to a 6.5 inch wrist. The dial is original. The solid gold case and integrated bracelet appears to be BARELY worn and looks fabulous. The original ROLEX crown is still present. The ROLEX manual winding movement was just cleaned and is accurate. This is a time capsule ROLEX!